Gravity Probe B is the relativity gyroscope experiment conducted by NASA and Stanford University to test two predictions of Einstein’s general theory of relativity. GPB is essentially looking for the effects caused by the mass of the Earth bending space-time around the Earth as Einstein’s theories suggest. One observable should be the geodetic effect estimated to be about 6 arc seconds per year. The other is a frame dragging effect of about .042 arc seconds per year. GPB will look for these effects by tracking a guide star, about 300 light years away, and seeing how the gyros move in relation to the known proper motion of this relatively fixed point in space. Important to our purposes, the GPB technology appears ideally suited to determine if our solar system is curving through space. GPB is not concerned with subtle motions of the earth, such as nutation or theoretical luni-solar precession, as it will float about 400 miles above the earth (in a polar orbit) free from these effects. It will keep one of the outer gyros in freefall position as the spacecraft orbits the earth, while the earth orbits the sun. Consequently, the spacecraft will track the earth’s larger motions (orbital, and binary if it exists) as it moves with the earth through space, without mimicking its lesser gyrations. As readers of this site know one predication of binary theory is that the observable commonly called the “precession of the equinox” is not due to local forces wobbling the earth but is principally a result of the solar system’s motion through space in its binary orbit. In short, we believe a moving solar system is responsible for producing the observable called the precession of the equinox, while the earth wobbles very little relative to objects inside the solar system. In order to isolate the geodetic effect and the very small GR effect, the GPB team has to separate out a number of unwanted signals. 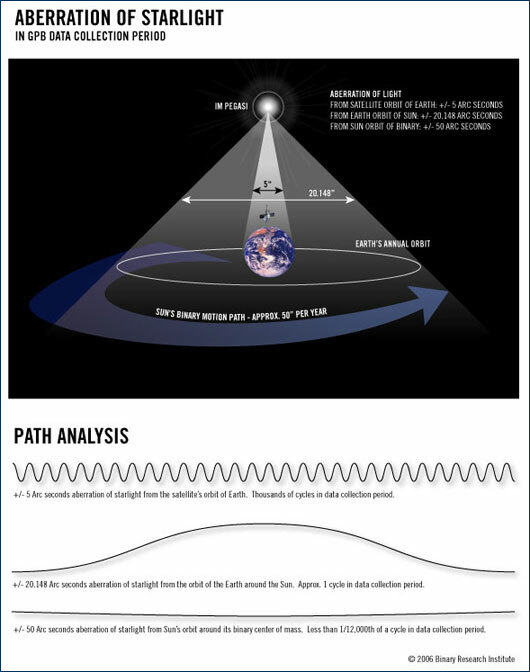 One, the well-known aberration of light due to the motion of the spacecraft around the Earth (slightly changing the telescopes orientation to the guide star with each orbit), amounts to +-5” per orbit, and is easy to identify due to the short periodicity. Another, the aberration of light due to the Earth’s annual orbit around the sun (carrying the spacecraft with it), may be less obvious because the Earth only went around the sun once during the GPB data collection period. But it too is a well-known effect, and quite large (+- 20.148”p/y), and therefore should also be readily identifiable. Now here is our part: If BRI is correct that the Earth also has a third motion, moving with the Sun in a roughly 24,000-year orbit (producing the bulk of the observable known as the precession of the equinox [360 degrees divided by 25,800 years = 50” of geometric precession p/y ) then there should be a third aberration, unexpected under current theory. However, because the periodicity of this motion is so long in relation to the data gathering period of the spacecraft (showing less than 1/12,000th of the binary waveform peak to trough in one year) it would likely only be detected as drift rather than any obvious cycle, but the effect will be fairly large, on the order of 50”p/y. Hence, it would mimic general precession even though there is no cause for such an observation because the spacecraft is not wobbling like the earth. This would be overwhelming evidence that the bulk of the observable of general precession of the Earth is actually due to the motion of the SS, and very little to local effects. The Stanford team has a big task in separating the enormous amount of data received into identifiable signals, each with a known and justifiable cause. If they cannot justify each and every signal then their attempt to isolate the small geodetic and frame dragging effects will lack credibility. Beyond the binary effect, other theorists are suggesting some small noises that may also have to be separated out, if they exist. However, none of these is of the magnitude of the binary (precession of the equinox) observable. So while the analysis might take some time, we expect the largest surprising effect will be a roughly 50”p/y signal that seems to show no periodicity, that looks like drift and coincidentally mimics the precession of the equinox observable. The delta between a tropical year and a sidereal year, long known to be the value of precession, would now be recognized as simply the observable of a solar system that curves through space. A tropical year, now thought to represent a motion of the Earth around the Sun that is 50” less than 360 degrees, would now be understood as a 360 degree motion of the Earth around the Sun. The reason the background stars change at the rate of about 50”p/y is due to the solar system curving through space at this rate, not because the Earth wobbles 50”p/y. The sidereal year would now be seen as a period that is about 50”p/y longer than one Earth orbit around the Sun. The extra motion has been offset or masked in the solar system’s journey through space. .” GPB could unexpectedly prove to make one of the most fortuitous finds in the history of astronomy. This is the rough current rate. The rate will change over time subject to the eccentricity of the orbit according to Kepler’s laws. This would also show up in all other observations from earth but here we already have a name for this 50’” observable – we call it precession. Thank you Jonathan, the Final results have today been published in Physical Review Letters, which you may access through the GP-B website: Gravity Probe B: Final Results of a Space Experiment to Test General Relativity and a Viewpoint article by Professor Will: Finally, results from Gravity Probe B. However, three important, but unexpected, phenomena were discovered during the experiment that affected the accuracy of the results. First, because each rotor is not exactly spherical, its principal axis rotates around its spin axis with a period of several hours, with a fixed angle between the two axes. This is the familiar “polhode” period of a spinning top and, in fact, the team used it as part of their analysis to calibrate the SQUID output. But the polhode period and angle of each rotor actually decreased monotonically with time, implying the presence of some damping mechanism, and this significantly complicated the calibration analysis. In addition, over the course of a day, each rotor was found to make occasional, seemingly random “jumps” in its orientation—some as large as 100 milliarcseconds. Some rotors displayed more frequent jumps than others. Without being able to continuously monitor the rotors’ orientation, Everitt and his team couldn’t fully exploit the calibrating effect of the stellar aberration in their analysis. Finally, during a planned 40-day, endof-mission calibration phase, the team discovered that when the spacecraft was deliberately pointed away from the guide star by a large angle, the misalignment induced much larger torques on the rotors than expected. From this, they inferred that even the very small misalignments that occurred during the science phase of the mission induced torques that were probably several hundred times larger than the designers had estimated. What ensued during the data analysis phase was worthy of a detective novel. The critical clue came from the calibration tests. Here, they took advantage of residual trapped magnetic flux on the gyroscope. (The designers used superconducting lead shielding to suppress stray fields before they cooled the niobium coated gyroscopes, but no shielding is ever perfect.) This flux adds a periodic modulation to the SQUID output, which the team used to figure out the phase and polhode angle of each rotor throughout the mission. This helped them to figure out that interactions between random patches of electrostatic potential fixed to the surface of each rotor, and similar patches on the inner surface of its spherical housing, were causing the extraneous torques. In principle, the rolling spacecraft should have suppressed these effects, but they were larger than expected. The patch interactions also accounted for the “jumps”: they occurred whenever a gyro’s slowly decreasing polhode period crossed an integer multiple of the spacecraft roll period. What looked like a jump of the spin direction was actually a spiraling path—known to navigators as a loxodrome. The team was able to account for all these effects in a parameterized model. The original goal of GP-B was to measure the frame-dragging precession with an accuracy of 1%, but the problems discovered over the course of the mission dashed the initial optimism that this was possible. Although Everitt and his team were able to model the effects of the patches, they had to pay the price of the increase in error that comes from using a model with so many parameters. The experiment uncertainty quoted in the final result—roughly 20% for frame dragging—is almost totally dominated by those errors. Nevertheless, after the model was applied to each rotor, all four gyros showed consistent relativistic precessions (Fig. 1, bottom). Gyro 2 was particularly “unlucky”—it had the largest uncertainties because it suffered the most resonant jumps. Thanks for the excerpt from Professor Wills (head of review board) who has looked at many of the efforts the team has gone through in trying to identify and separate the various unexpected sources of noise. His own work depends on Einstein’s GR, so it is not surprising that he would support the conclusions, nonetheless he was very clear that a lot of assumptions were made in arriving at the final conclusions. It is impossible to know if all the assumptions in the parameterized model are ideal for properly categorizing and canceling each noise without knowing for certain the source of each unwanted signal, but the GPB team seems to have done the best they could based on the circumstances. The inability to continuously monitor the rotors’ orientation meant the stellar aberrations could not be utilized as calibrating tools (as planned) hints at the amount of noise in the overall experiment. But even attempting to use the diurnal and annual aberrations as the main calibration tools shows the experimenters did not plan on accounting for any solar system motion relative to the guide star – meaning they essentially used a static solar system model. The issue I would still like to understand is if any of the “noise” might be evidence of solar system motion. If for example we discovered the solar system is just slightly accelerating, then it might explain the anomalous acceleration of Pioneer 10 and 11 and possibly shed light on the unexplained force acting on our spacecraft flybys (Galileo, NEAR, Rosetta, Cassini, etc. ), that could theoretically be explained by an accelerating solar system. Maybe what Everitt calls “strange anomalous torques” are not all “criminals”, as he put it? The point is it probably makes sense to very carefully examine all the assumptions behind the unwanted cancelled-out noise to make sure we didn’t eliminate something even more fundamental than GR, that is, solar system motion.